Notes: A Bronze Age standing stone measuring 3.4m high, 1m by 0.4m in section and in good condition. 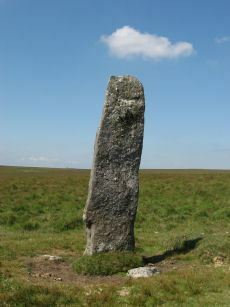 One of the few isolated menhirs on Dartmoor. See also, Legendary Dartmoor: Dartmoor's Beardown Man. Lethbridge diagram p.107, photo p.108. Notes: Grinsell LYDFORD 32. Butler Vol 2 30.11 p. 77. Maybe natural rather than a cist, see very useful notes on Megalithic Portal. 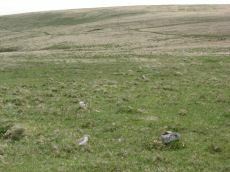 Butler says "a large turf-covered cairn which has been dug into from its southern edge. No stones are visible in the saucer-shape depression in the centre but a setting of three slabs near the northern edge may be the sides of a cist which contained a secondary burial inserted at a later date into the side of the mound". Lethbridge diagram p.107, photo p.108.